This is one of best ways to warm your food in the microwave. Simply place your bowl inside the microwave cozy, place it in the microwave, close the door. Push the timer (use 2 minute increments) and when ready, take out of the microwave with your bowl cozy hot pad. Or, when eating ice cream, place your bowl in the microwave cozy and it will keep your fingers from ice cold. The measurement of the cozy shown measures approximately 8 - 8 1/2". Safe to machine wash & dry. The bowls shown in the pictures not included. See our store for other color schemes and themes. 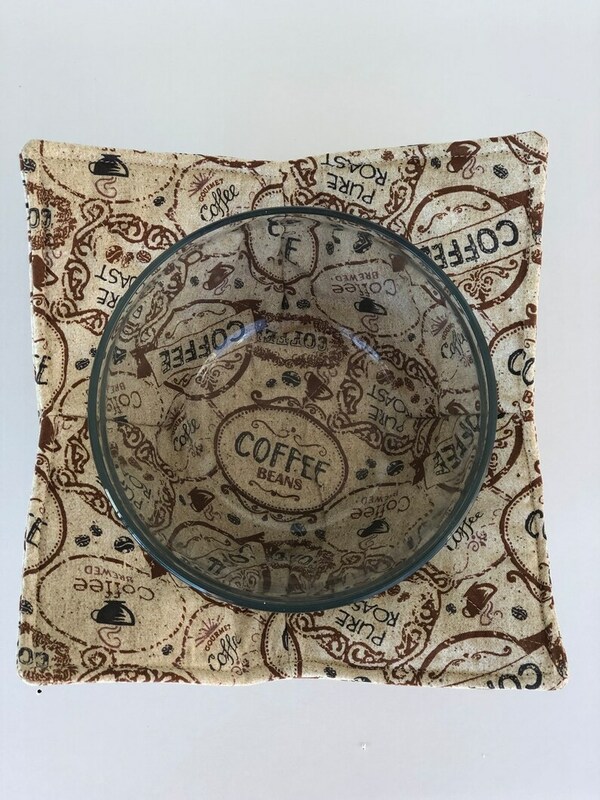 For bowl/plate cozies or potato bags, these are 100% cotton fabric, cotton batting, and cotton thread - safe to use in microwave for limited time limit to avoid burn spots or fire hazard. DO NOT EXCEED 3 MINUTES PER INCREMENT, as each individual listing explains. Please wait 2 minutes per increment and rotate position in the microwave. Recommended - to launder (wash/dry) before use. Due to personal configuration, inscription, or design on these products, the seller is not required to accept returns or exchanges unless the products are damaged or defective upon arrival. All items must be unused, unwashed, original condition. Include packing slip and any packing materials, if any used. I will refund the item upon the return and approved condition of the product. Due to severe allergies, smoking scent is considered damaged any product unable to resell or refund, item will be discarded. Exchange may not possible, if price differences of each item. If you are sending the item within the United States and the order is valued at $50 or more, insure the shipment for the value of the merchandise and ship your return with a signature shipping service. Items valued over $50 must be returned to the seller with a trackable shipping service. For items below $50, we suggest USPS delivery confirmation service. If a package doesn't arrive and you don't use a trackable method to return, the refund may not be approved without proof of delivery.